Stocks don't always show signs of distribution before they top out. Instead, their character changes, which may take the place of classic distribution signals. 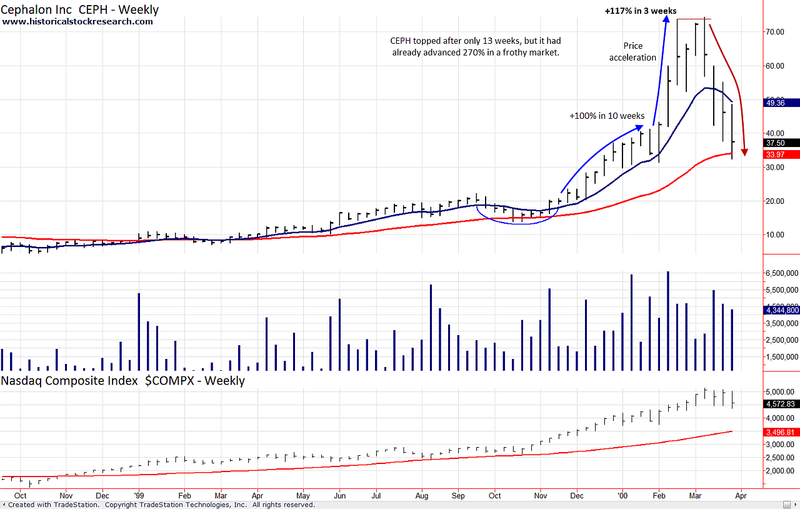 A price acceleration above a rising 10 Week Moving Average is one example of a change of character that's been associated with significant tops in stocks. However, there's one distinction to be aware of when looking for a price acceleration; the acceleration should occur AFTER a stock has already had a large move to the upside. 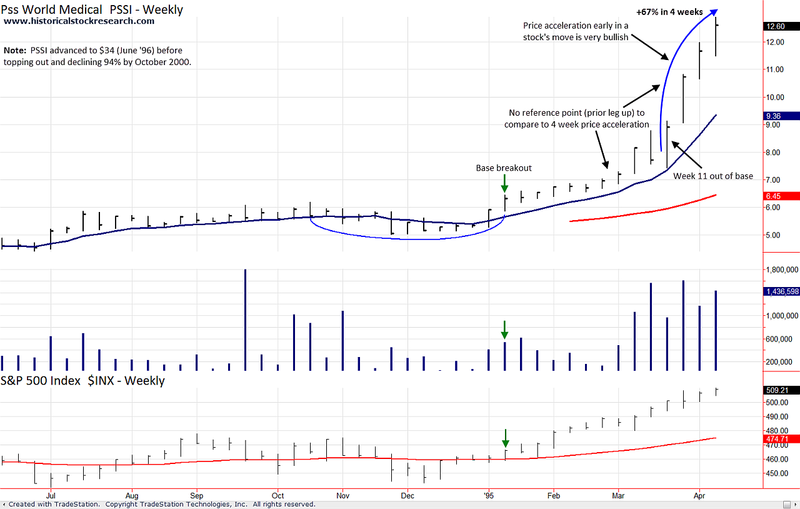 Because in a price acceleration, it's best to have a prior leg up to compare to the current trend (see Chart 1). This can help you identify steep advances when price accelerates higher. 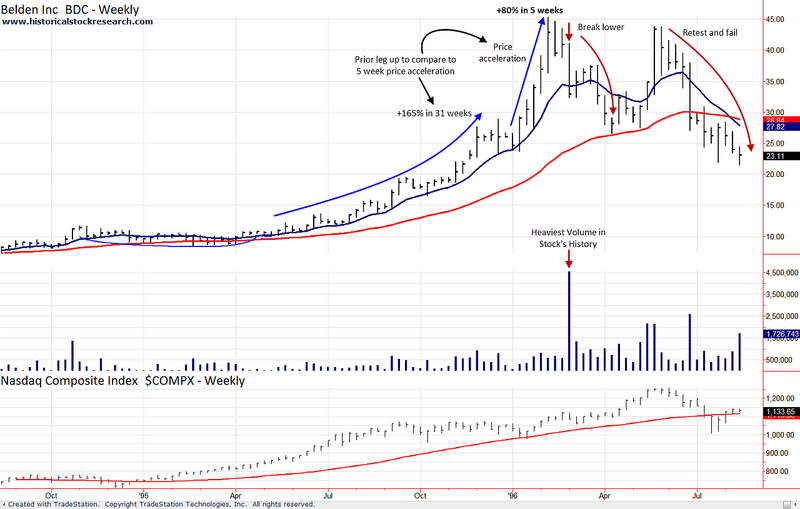 In contrast, a stock that has an acceleration following a base breakout usually has no reference point to make the same comparison (see Chart 2). Keep in mind that this doesn't mean that a stock can't top out on a price acceleration shortly after breaking out. I mention this not to confuse you, but to point out the different looks that the market can give you during price acceleration tops. For example, a stock may break out and have a multifold move in a short period of time that ends with an acceleration into a top. This exact scenario happened to some stocks during the Nasdaq's parabolic rise into its March 2000 top (see Chart 3). Please >>CLICK HERE<< for the historical chart examples of Price Acceleration Tops. Please >>CLICK HERE<< to go to Price Reversal Tops.